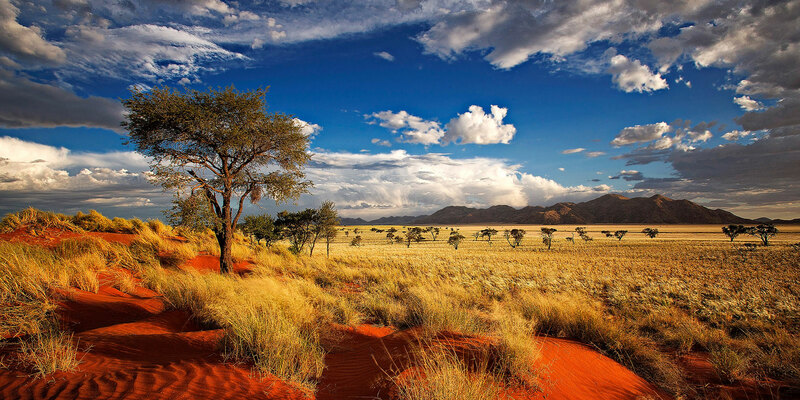 Namibia lies on the west coast of Southern Africa. It borders Angola to the north, Botswana to the east, and South Africa to the south. A small panhandle protrudes from the northeast corner of Namibia, known as the Caprivi Strip and it touches both Zambia and Zimbabwe. The cold Benguela current of the Atlantic Ocean keeps the coastal areas of Namibia cool, damp, and rain free with think coastal fog often prevalent. Inland, rain falls during the summer months between October and April; days being hot while the nights are cool. Namibia covers an area of some 825,000 square kilometer and is sparsely populated with only about 1.3 million inhabitants. English is the national language, however Afrikaans, is widely spoken with German and Bantu in some areas. Namibia is known for it's rich and diverse wildlife resource and over the past several decades has been a prime destination for sport hunters from all over the globe. Conservation programs have largely protected this important resource and species such as the Kudu, Giant Oryx, Springbok, and even the Warthog are found in abundance. With the government's positive attitude toward Sport and Trophy hunting outfitters from all over Southern Africa, visit to take advantage of Namibia's great hunting opportunities. The hunting industry has proven itself crucial to ensuring the survival of Namibia's game species. Among the species indigenous to Namibia are: the typical plains dwellers such as the Springbok, Blue Wildebeest, as well as the Elephant. Namibia sports the largest population of Black Rhino in all of Africa. The Roan Antelope is making a recovery and several antelope species such as the Red Lechwe, Waterbuck, Reedbuck, and the Sitatunga can be found in the wetlands of the far northeast. I you're looking for something different, you might like Leopard hunting using dogs, a bit more active than the traditional Leopard on bait from a blind. Namibia is a great place to hunt, let Marvel Africa Safaris organize your next Namibian Safari.